This is the first time I’ve shown こうやどうふ (koyadofu) on this blog. 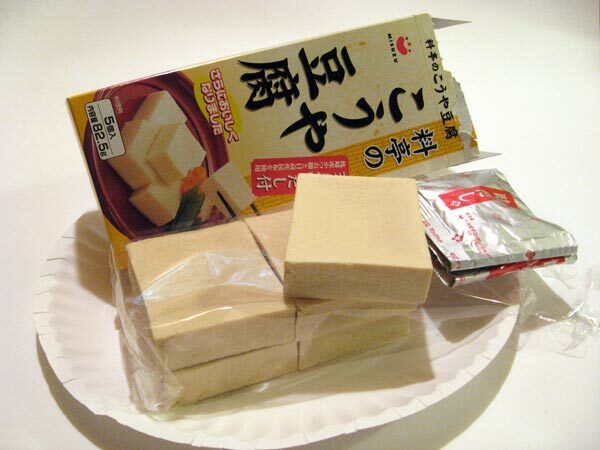 It’s essentially freeze-dried tofu that can be re-hydrated for use in stir fries, soups, etc. I guess it could be Japanese astronaut food…except I think it’s pretty yummy. I sometimes take it in my lunch since I’m afraid of leaving regular tofu unrefrigerated when I’m at the gym before work. I just add some water and soy sauce or put it in soup. It is indeed spongy, which might turn some people off, but I quite like it. You can see a picture of it “plain” here. So for this dish, Yusuke began by soaking the koyadofu in water for about 10-20 seconds, then squeezed out all the water (fun! ), and cut it into cubes. He then boiled chopped snap peas for a few minutes with salt and then drained them. Next came chopped green beans along with the koyadofu. The next addition was thinly sliced abura-age (deep-fried tofu sheets). He let everything simmer for a while. Finally, he poured in beaten eggs and let them cook briefly. The mirin and sugar gave this a lovely sweetish taste balanced by the soy sauce, which the koyadofu soaks right up!